The first thing one notices is the striking difference in marquetry motifs of this table versus other Oeben tables of similar function. Typically, the aprons are covered by parquetry, and the top in marquetry. This table, however, features an assortment of flowers connected by a circuitous vine on a background of yellow veneer throughout both the top and sides. Two curators have independently commented on its similarity to a known fabric pattern. Something else that is distinctive about this marquetry, I was told by Rose-Marie Mousseaux, the museum director, is the flowers appear to have been rendered life-sized. It is as if the marquetier laid the flowers directly on the veneer to cut them. The marquetry on the legs appears to be nearly symmetric. Viewed from either side as well as front, or back, the leaf and flower patterns are near-mirror images. Perhaps they were packet cut? Inside another visual anomaly is the veneer covering the interior of the compartment lids. This is typically tulipwood arranged in a reverse-diamond match (image below right of the Getty table). While the pattern is consistent, however, the choice of veneer species is not. It appears to be mahogany (below left image – Cognacq-Jay table). Cognacq-Jay table compartment cover interior in mahogany. Getty table compartment cover interior tulipwood. Finally, this table has no keyholes! Without locks, or winding axles, this table can only be opened by manually pushing the top back. First most obvious thought is that we are not seeing the table in its original state. Approximately 260 years have elapsed since it was built, and the differences could simply be due to changes and modifications from repairs. It could also be that this table is the work of someone other than Oeben. In his style…, so to speak. Although this is unlikely, the piece is not signed, and unfortunately, there is little existing provenance on it. Finally, perhaps this was a prototype constructed to test the concepts of a movable top and main box to refine the mechanisms [or a demonstration piece!]. This is a supposition. However, with a piece this complex a good maker would want to demonstrate the concept before showing it to prominent clients. It is reasonable that the racks and gears responsible for operation of the top and main box would be tried “small scale” first. I appreciate the opportunity to view this piece first-hand, and want to thank Madam Mousseaux and her staff for hosting me on the museum’s off-day. As mentioned previously, there are at least four tables Oeben made similar to this located in North America. In September of 2016, I was fortunate to be granted access to the one in The Metropolitan Museum of Art in New York City. Whenever more than one of something is made, comparisons are inevitable. With a date of 1763, the table at The MET, as it is known, is perhaps the last of the mechanical tables to be made. Completed by Oeben’s brother-in-law, Roger Vandercruse (Lacroix), it was destined for Mmde Pompadour’s personal use, although there’s question as to whether she ever did. She died the year following Oeben. Being the case, this is perhaps the most highly refined table in the series. Contrast this with the table that is the focus of this re-creation. Dated at 1750, it appears to be one of the first, and might possibly be the prototype for the form. It features a full-length lower drawer accessed from the proper-left side beneath the movable “main box”, a part not found on any other table in the series, that I’m aware. 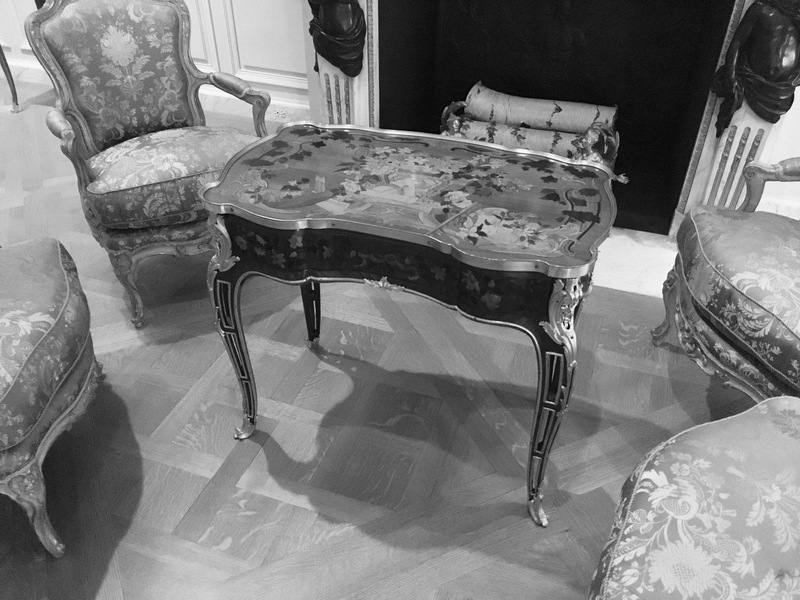 Also, the legs on the 1763 table are pierced, and lined with ormolu, a mark of high refinement. More important to the interests of this re-creation are the differences in the mechanisms. Unfortunately, just as with the Getty table, it was not possible to directly examine the mechanisms, and since, as I understand, The MET has never dismantled the table for conservation treatment, they possess no photos or x-rays. Visual inspection shows that both tables feature key holes in the side aprons to wind the mainspring barrels, the power source which makes the tables operate. However, tables made after the 1750 specimen, also feature an X-like mechanism connecting the rear of the main box to the interior of the carcass. Its function, I assume, is to assist in smoothly propelling the main box, applying even pressure to prevent it from becoming stuck. Another discovery, the 1763 table lacks stop rods! To arrest the motion of the table in operation (and keep the table from flying apart), metal rods extend up through the side aprons, and into the table top. Metal plates reinforce the wooden grooves in which they “travel”. This is the situation on the 1750 Getty table. Evidence shows these rods existed on The MET table, but are now absent, suggesting the table has been modified. I thought that by examining other tables in the series, I might gain insight into Oeben’s design decisions. Instead, it seems to have had the opposite effect. Differences in their original construction, combined with subsequent modifications, serve only to confuse matters. While we certainly expect differences in appearance, one anticipates their operational modes to remain nearly identical. Further study is warranted.